Alcohol affects us all when we consume it, but not everyone in the same way. The basic processes (absorption, distribution, elimination) are the same for everyone, but the speed at which we metabolize alcohol depends on our size, gender, whether we have eaten recently, and other factors. When we drink, alcohol it's absorbed into our blood and distributed throughout our body. Although a very small bit of alcohol is absorbed by the mouth and esophagus, most gets absorbed by the stomach (almost 20%) and the small intestine (80%). As it is absorbed, alcohol is distributed throughout the water-containing components of the body by way of the blood stream. Thus organs like the liver, kidneys, lungs and brain absorb more alcohol than regular tissue. Alcohol is eliminated from the body by evaporation, excretion and metabolism. My purpose isn't to go into all the bad things that come from consuming alcohol, and there are a few. Here I just want to give you an idea of how much an average person can drink at a tailgate party and still be a congenial guest or host. According to Wikipedia, the free encyclopedia, “Blood alcohol content (BAC), also called blood alcohol concentration, blood ethanol concentration, or blood alcohol level is most commonly used as a metric of alcohol intoxication for legal or medical purposes.” This chart shows how you obtain your BAC. Click here to view a printable table of how much a person can consume and still be legal. 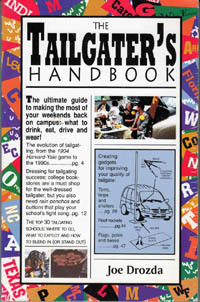 Now let's use the BAC as a guide for tailgating. On average, a healthy person eliminates2 about 14 grams (.05 oz.) of alcohol per hour. So all one needs to do is figure the math. According to The Encyclopedia for Alcoholism the average man lowers their BAC by .015 per hour and the average woman lowers it .011 in an hour. Male Example - If a 200 lb. Male has two drinks before the game at a one hour long tailgate party he will have less than a .04 BAC at the highest, but after one hour of tailgating and three hours of abstinence during the game he'll be back down to .00. This average male should be able to enjoy himself at the game and the tailgate party. Female Example – If a 140 lb. Female has one drink at an hour long tailgate party before the game she'll have a BAC of less than .03. After three hours inside the game she'll be back down to a BAC of .00. This average female should also be able to enjoy himself at the game and the tailgate party. If you are going to be a good host or guest or drive a vehicle you should always strive to keep your BAC well below .05. Caution – We do not encourage you to consume alcohol. This writing is not an endorsement or condemnation of consuming alcohol. It is meant to let you see what happens when you do consume alcohol.